The Impact Collapsible Reflector Disc is a versatile lighting tool for in the field and in the studio. It allows you to bring out the shadow detail in your subject, using available or studio lighting. In addition, the colored surfaces allow you to modify the color of your subject. Your choice of color -- silver, gold, soft gold, reflective or translucent white -- will be determined by the lighting conditions, and personal preference. This 42" round disc is suitable for a 3/4 length portrait, and a medium-size still-life setup. It folds down to 1/3 its open size, and comes with a storage sleeve. This two-handle 42" 5-1 Circular Collapsible Reflector with Handles from Impact adds a polished-looking quality of light to your photos or videos. The reflector is built around a translucent disc which doesn't reflect as much as the solid white surface, but does exhibit soft neutral reflection. Its primary purpose, however, is as a diffuser that will tame contrast by being held over a subject's head in the harsh noon-day sun. The disc can also be used in situations where you'd use a softbox. Using a disc holder or one of the 3/8" sockets, place your flash or constant light behind the suspended disc for soft, flattering light with open shadows. The 5-in-1 reflector has handy convenience features that make it easy to use and deliver impressive results, while saving space by folding down to approximately one third of its open size. Impact's smart design provides ergonomic handgrips that allow you to hold the disc in a flat or U-shaped position, or in any way that gets the job done. Each of the grips has additional 3/8"-16 threaded sockets for attachment to accessories or grip equipment. The 5-in-1 Reflector comes with a carry/storage case. The surfaces are available on two removable, reversible sleeves that slip over the disc. Silver offers very high reflective qualities that render a snappy high-contrast look with a cool color bias. Just the opposite, the Gold surface reflects a very warm quality; similar to late afternoon or sunset light. The Black fabric subtracts light from the subject, and can be used to block out unwanted light or to greatly reduce reflections on shiny or reflective surfaces. Finally, the flat White surface provides neutral reflectance with a soft quality of light. 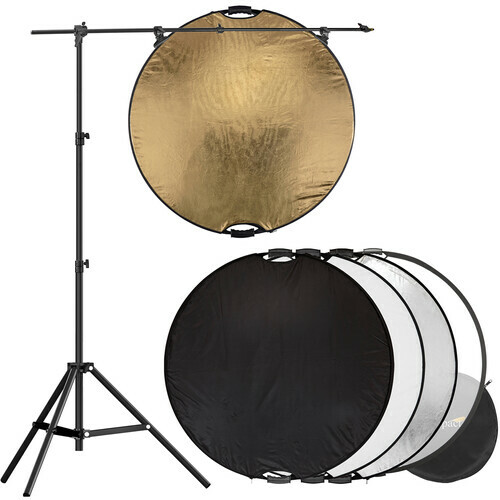 Box Dimensions (LxWxH) 15.65 x 15.55 x 2.6"
42" 5-in-1 Reflector with Lightstand and Holder Kit is rated 4.6 out of 5 by 18. Rated 4 out of 5 by Mike from Great Kit You can use the boom stand for multiple uses. I found the reflector a bit heavy for the stand; counter weight should be used. Rated 5 out of 5 by tom the film guy from Perfect setup for bouncing or diffusing light. I love these impact stands. Easy to pack and do a good job of holding these reflectors in many different positions. I use them to bounce light or to light through the diffuser. Great setup. Rated 4 out of 5 by Heidi from Very Cool Kit Easy to set up the holder kit once you figure it out (no instructions in the package), I had to look at the picture and fiddle with knobs to get it set up. The reflector kit is easy to use inside the house (no wind), I would have liked something on the bottom of the reflector to allow it to hold its angle. I'm giving it a 4 star due to the time it took to initially figure out the holder kit set up. Rated 4 out of 5 by Anonymous from As advertised, it's a decent little stand and reflector The price is right for this lightweight and flexible setup. Does exactly what it is intended, no complaints here. Rated 5 out of 5 by ASmith7 from Great value for entire package Solid stand and arm. Reflector is a great size and the 5-1 offers great versatility. Would highly recommend. Rated 4 out of 5 by Patrick from Nice Bundle I purchased this bundle to use with portrait photography. The reflector folds to a nice compact size and the included cover with multiple color choices is very easy to use. The stand is huge and expands easily. Since this reflector is so large, I would recommend using a counterweight on the stand if you are going to be in any wind. Overall this was a good addition to my lighting setup. Rated 3 out of 5 by Heidi from Becomes a wind sail outside. If you are using this inside or in a no breeze area it would be great. Any little breeze and it becomes a wind sail. Set up is easy enough once you figure out the lightstand configuration (no directions). Can this light stand, with the proper add ons, be used with a speedlight instead of the reflector? The Impact Umbrella Bracket with Adjustable Shoe, B&amp;H # IMUB, would be recommended to connect a hot shoe speedlight flash to the Impact 42 5-in-1 Reflector with Lightstand and Holder Kit listed above.